The Tangled Web of TVB; #1. TVB and the entertainment industry in Hong Kong is a big Asian market, and what with the dozens of series filmed a year and the hundreds of interviews and promotions their actors and actresses carry out to promote their series and their personal commitments to sponsors, you can be sure many relationships and ties will be forged. Put that together with the awfully innovative pens and magically cropped pictures of the dog-eat-dog HK paparazzi, you can be sure that these relationships will be completely spiced up. The supposed relationships and rumours that these people conjure up make up such a big part of the industry, that I couldn’t not have a section covering these interesting partnerships and bonds. The Tangled Web of TVB will be an ongoing feature (or rather, I hope it’ll be) in this blog featuring the many different relationships between artistes and/or characters that occur, be it through coincidence, things they could have in common, mutual friends or just an interesting little tidbit that I have to share about these artistes. Today’s first article, might not be as meaty a piece as what you might have been hoping for (mainly because I don’t possess the imagination which the HK reporters do, lol), but it’s a very interesting tidbit which I’ve realised just recently. In 2003, it was Triumph in the Skies that shot this group of four young, intelligent pilots into stardom. After the series aired, all eyes were on these four relatively new actors. 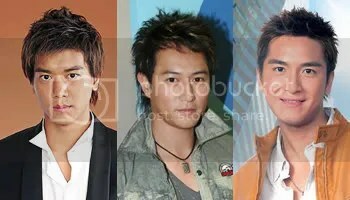 Dubbed S4, short for ‘Solar 4’, by netizens, Ron Ng Cheuk Hei, Sammul Chan Kin Fung, Bosco Wong Chung Chak and Kenneth Ma Kwok Ming were the hot male newcomers of TVB. 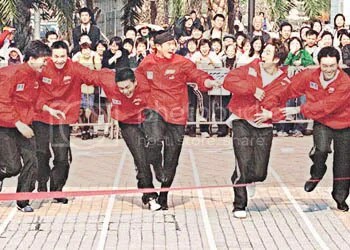 The following year, TVB named six young male artists to promote the 2004 Athens Olympics. These were the cream of the crop of young actors, often still labelled the ‘Six Olympic Stars’ until today. The Triumph in the Skies bunch were all named, along with the already-widely-popular Raymond Lam Fung, and the fresh new face in TVB acting class graduate Chris Lai Lok Yi. Then, just last year, yet another promotional group was named, this time for the 2006 FIFA World Cup. 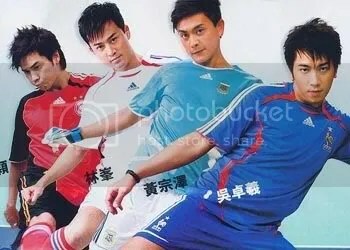 Three out of the ‘Six Olympic Stars’ were retained, and Kevin Cheng Ka Wing was added to the bunch. Solely based on TVB management and promotional strategy, if you asked me to name you a list of the new generation ‘siu sungs’, it would be these seven. 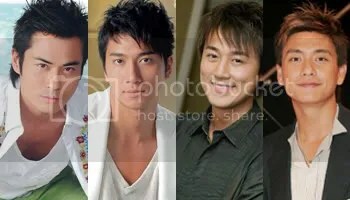 The recent World Cup quartet are undoubtedly the most favoured young actors in TVB at the moment. Kevin Cheng winning latest TVB Best Actor award, although I strongly disagreed with the award, and his good looks, coupled with his good relations with TVB executives, definitely puts him in the top four. As for the other three, it goes without saying. These three would be on the tips of everyone’s tongues, if I had asked you to name me three young, successful TVB actors. The previous winners of the TVB Most Improved Actor award, Raymond, Ron and Bosco have definitely carved quite a name for themselves, being cast in one big production after another. Bosco tops the list with Dicey Business, HOG and Jewel’s Splendour, while Raymond and Ron are both in the Drive of Life, and HOG and Brink of Law respectively. Until this year’s TVB Anniversary Awards, Kenneth Ma is still the current holder of the Most Improved Actor award. However, IMO, he does not possess the success and the pizzazz of the other three previous winners just yet, and has not been casted in any such grand productions in a major role. Sammul Chan is the only one left out of the S4 who hasn’t won that award yet, and while I felt that he deserved it at that point in time before some of them, rumour has it that he hasn’t won because he was not a contracted TVB artist. However, he’s back to filming with TVB, and if I remember correctly, might even have signed on with TVB (could someone please tell me if I’ve gotten this right? ), so that’s good for him. Chris Lai has not been mentioned nearly as much as the others have, but after watching Heart of Greed, and the current screening of The Green Grass of Home, I think it’s safe to say that he’s gaining popularity and should be on this list. However, that’s not the point of this write-up. What I found most interesting, while making this list, was that there was one thing they all had in common. Obviously, they’re all male, young, promoted by TVB, popular, lusted after by millions of female fans, etc. You get my drift. But there’s one other thing they all have in common with one another. That’s right. All seven of these actors have been paired up with the beautiful Leila Tong Ling in numerous series over the years. I don’t know about you, but I found that rather surprising. It might have been expected, being that TVB doesn’t have a very large base of capable young actors and actresses, but however, I would have guessed that it would’ve been Leila. Don’t get me wrong, I love her, but I didn’t know, I would have guessed the female who had co-starred with all seven would have been someone like Myolie. Here, let’s take a walk down memory lane with Leila and the seven guys. This was the first series in which I ever saw Kevin and Leila acting. They’re both extremely easy on the eyes, but their characters seemed too different, and his character Mark was actually using her to get promoted, if I remember correctly. Nevertheless, they did have a few cute scenes together, albeit nothing that memorable. Leila looks so young with her long, straight hair. Definitely one of my favourite Leila pairings. Ken and Ching Ching were such a lovely couple to watch, from all their bickering, and his blatant flirting with her all the time, and later on, when she realised she loved him, and how she stuck by him and waited for him during his sickness. I’ve never watched Ten Brothers, just a short promotional trailer and a few clips here and there. I’m not exactly sure if they ended up together, or if they were both in a love triangle with another one of Chris’ brothers in the series. They do look pretty cute together, though. Three times they’ve worked together, and all three times it was great to watch. Their puppy-love relationship was adorable in Aqua Heroes. In The Last Breakthrough, although I loved Ken and Ching Ching, I have to admit, the Bosco/Leila scenes where he was secretly crushing on her were also great to watch. In Life Made Simple, they both portray the most mature relationship in their partnership on-screen; Leila was a fantastic devious Angel in angel’s clothes (horrible pun intended) who in the end, realised that she had indeed really fallen for Michael. It’s no surprise that this pairing has tons of fans. I was rooting for Ron & Leila in Twin of Brothers, because there was just that something that I liked about their relationship. I can’t place my finger on it exactly, but I remember liking it. They also look compatible together. I haven’t watched War and Destiny in full, just little bits here and there again, but I really want to because I’ve read some good reviews, it looks rather compelling and Leila apparently plays her most mature role yet, so I really want to catch it. Plus, apparently Ron and Leila’s characters have a very bittersweet relationship in the series, and I’m a sucker for those. I’ve always wondered if they would ever be paired up in a series together. Both of them are cute and look so youthful, that they would look adorable together. This is definitely one series I want to watch, although Adam Cheng usually annoys me; I’m willing to watch for the Sammul/Leila storyline. Both of them also apparently acted very well in here. Extra info: I was searching around for pictures for this post last night, and I stumbled across this radio clip where Leila has to call a co-star up and play a prank on him/her. She chooses to call Sammul, and his reaction to it is pretty funny. Click here to hear it! Haven’t watched this either, although it’s one I’m hyped up about catching. However, I don’t think they look as good together physically, compared to the way Leila matches the rest. They have a pretty large fanbase already, so I’m hoping that they have an abundance of chemistry. What’s up next? Leila has finished filming in the mainland for The Last Princess, in which she’ll have somewhat of a relationship with Sammul, for the second time. She’s also now in the midst of filming The Hidden Master, where she’ll apparently be paired with Kenneth Ma. Fans of both pairings can rejoice. Which one is your favourite Leila pairing out of these seven young actors? Who would you like to see her co-star with again? *Screencaps are from the awesomely comprehensive gallery at Leila-Tong.com. Other pictures from TVB Chinese News Collection and spcnet.tv. wow!!! that is very interesting…im indifferent towards the seven guys… and leila; i thinks she’s a good actress, but i dont have that “feeling” for her… =Pbest pairing would be with… raymond… i think??? haha… next pairing… is there anymore young guys to choose from??? uh_oh: Thanks! Welcome, by the way! 🙂 Oh thanks for the links, I’m listening to them right now, and you’re right, they’re very funny.mc3: Nope, I don’t think there are any more young actors of Leila’s standards that she can be paired with, unless you want to take the Mr. HKs into consideration, which I definitely don’t want to, lol. What do you think about a Moses/Leila pairing? Hee. mc3: They’re definitely not ready, and I really don’t want to see someone like say, Rocky Cheng, leading a series. Surprisingly enough, Matthew Ko is not annoying me as much as I thought he would in TGWL.Hey you never know, what with Moses’ acting skills, they could make it work. Haha. Thanks for your welcome glazed.over and I’m glad you enjoy the radio show. =] As for other young artist – Leila pairings, she’s paired with Jack Wu in the newly released Phoenix Rising but I’m not quite sure if you guys like him. I love this update. I think that Ron and Leila or Bosco and Leila is the best pairing. I love Leila in Twin of Brothers! She looks sweet! Oh and yes, Leila does look young with her long, straight hair. I think she looks more Mature with her short hair. But i like her with that long hair, she looks so elegant with long hair. mc3: I can’t really stand Rocky, right from the beginning when I saw him in the Mr. HK pageant. Matthew Ko was bearable in TGWL, but nah, our favourites are definitely hotter. :Puh_oh: Thanks for the heads-up! Leila really has probably paired up with every other young, popular male actor already, now that they’re airing Phoenix Rising with Jack. I’ve liked Jack every since I saw Net Deception, and that was a pretty long time ago. Glad to see him in more roles.Amelie: I like both those pairings but I watched the first two episodes of Bar Benders and am really liking Sammul/Leila too! Lol. I agree, she looks more mature with short hair, but she can pull both looks off. Interesting article ^^ I quite agree with u that Kenneth doesn’t seem as ‘up there’ as Bosco, Raymong and Ron. I’m quite surprised with Leila. I haven’t watched some of hose series (lie with Kevin and all). Are you sure there’sno other actress with all of them? XDNice findings ! Keep it up! ktvb: Yeah, it’s pretty surprising, isn’t it? And she’s already paired up with some of them more than once too. I’ve cracked my head trying to think of something else, but I came up with nothing, lol. I think Tavia has been in series with all seven, but did not pair up with them in romantic relationships. HAHA. true. you would think myolie would be it. myolie has collaborated with kenneth in many series, but TVB always finds a better candidate to be myolie’s leading man. chris lai will aways be myolie’s lil brother ;p kevolie will happen in bf3.at least myolie holds the record for being paired up with older guys the most. haha. So that is the reason why is see all 7 of them so many drama nowadays. I really like Chris Lai acting. Moreover, he is really cute. I hope I will see more of him in the future.